The future of identity politics, and thus the moral and political mission of the left, is predicated on its capacity to organize people who are not white men. Her affair with a married man is something morally bankrupt feminists will have no problem justifying, but her tenure as California’s Attorney General is another affair to remember. 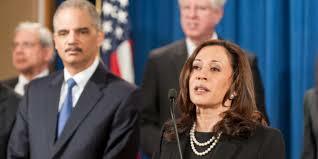 Like Obama’s DOJ, Harris weaponized the California Attorney general’s office and used it to punish her political enemies and protect her political friends. Following the mortgage crisis and housing bubble, Harris refused to prosecute the mortgage fraudsters in California when she had the chance proving that Obama’s $26 billion foreclosure fraud fix was just a settlement for big banks. Kamala Harris sponsored an asset forfeiture bill as recently as 2015. Asset forfeiture is the barbaric practice where cops are allowed to steal money, property and possessions from American citizens, who haven’t even been charged with a crime. As California’s Attorney General, Kamala demanded that non-profit Americans For Prosperity hand over its list of members and supporters. After trying to silence Americans For Prosperity through fear and intimidation tactics with a lawsuit demanding AFP’s donors list, a US District Court ruled her demands to be unconstitutional. Donors to organizations should be free to support causes they believe in without fear of retaliation, harassment, or intimidation by powerful government figures. The Court’s ruling confirmed that AG Harris had no right to police the beliefs of individual Americans or causes they choose to support. “Attorney General Harris ordered the arrest of Albert Sheakalee and seized 541 firearms in a highly publicized sting in 2015. According to a press release from then-Attorney General Kamala Harris, Shekalee was arrested “due to a prior mental health hold,” which prohibited him from owning firearms and allegedly landed him in the state’s Armed Prohibited Persons System (APPS) database. But the state never filed any charges. After receiving national media attention—including a press conference displaying all 541 guns—the case never moved forward. And who could forget the Undercover videos which surfaced in 2015 showing Planned Parenthood officials openly discussing buying and selling the body parts and organs from aborted babies for research. Rather than opening an investigation into Planned Parenthood for trafficking human body parts, then-Attorney General Kamala Harris filed charges against the undercover investigators, David Daleiden and Sandra Merritt of the Center for Medical Progress. Harris ordered Daleiden’s home to be raided, and using 11 agents, confiscated video research and evidence, in an attempt to prevent millions of people from seeing what actually goes on inside Planned Parenthood. According to the census and other reports, hypodermic needles, homelessness and hepatitis is our future…unless you’re Kamala Harris. “California’s top Senate candidate Kamala Harris has been using her campaign account to fund stays in upscale hotels and first-class airfares during her nearly five-year tenure as state attorney general,” The Hill reported in December 2015. The Hill’s investigation reveals that these expenditure patterns are consistent from January 2011 through the present. In a standard trip, for example, Harris billed her campaign $2,482.70 in January 2013 for Delta Airlines “airfare for candidate from Washington D.C./campaign events/Presidential Inauguration,” according to state records. On that same trip Harris stayed in D.C.’s upscale St. Regis hotel, billing her campaign $3,434.74 for a four-night stay, a nightly rate of $858.69. The next month, Harris charged $2,381.70 for “airfare for candidate to New Orleans/campaign event, issues.” Later, she stayed in the St. Regis in D.C. ($823.67), The Beverly Hilton ($1,722.59) and The London NYC hotel ($1,093.20). “She treats the campaign like a personal checking account to fund a lifestyle she aspires to,” the former aide added. Playing identity politics certainly has it’s privileges. Perhaps Kamala can come up with plans to fix racial inequality from her suite in the St. Regis.